Chaplain commission for John M. Guion, 14th Infantry Regiment, Connecticut Militia, 1 July 1841. 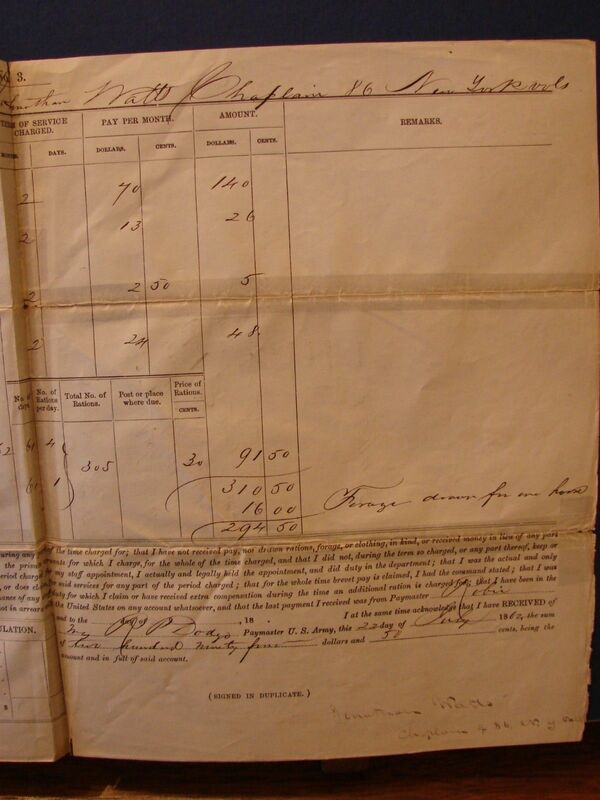 A pay voucher for a chaplain from 1875, perhaps involved in the Indian Wars. 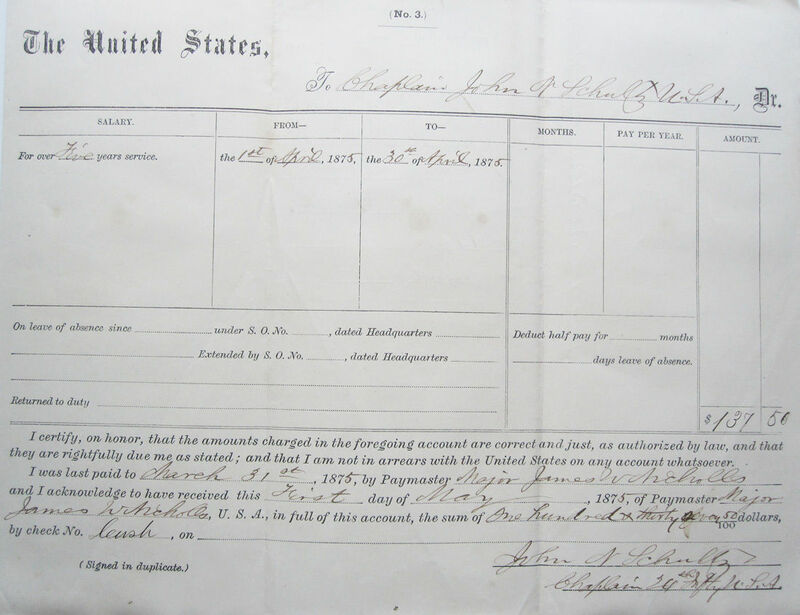 Chaplain R. L. Steel, 37th Regiment, NC Troops, CSA, Leave Form, 2 Jan 1862 (from Ebay listing). Chaplain L.D. Williams, 110th Tenn, U.S. 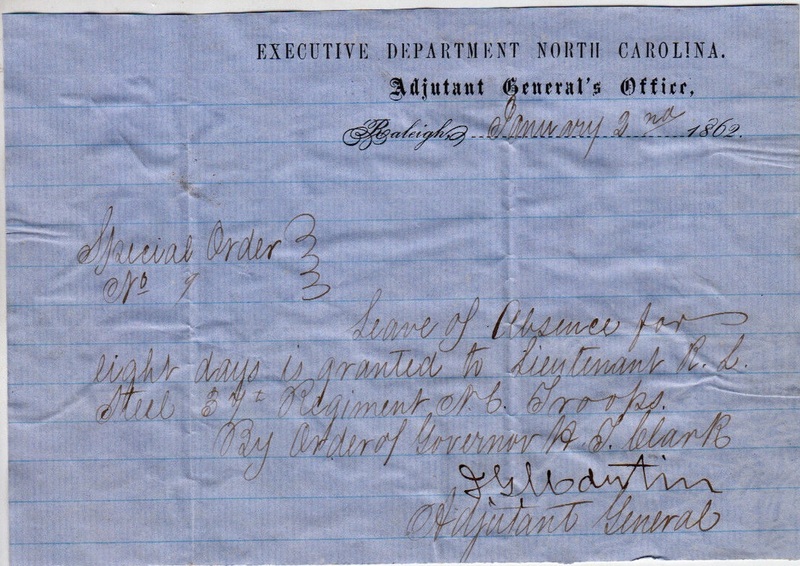 Volunteers, Pay Voucher, 1862. Form No. 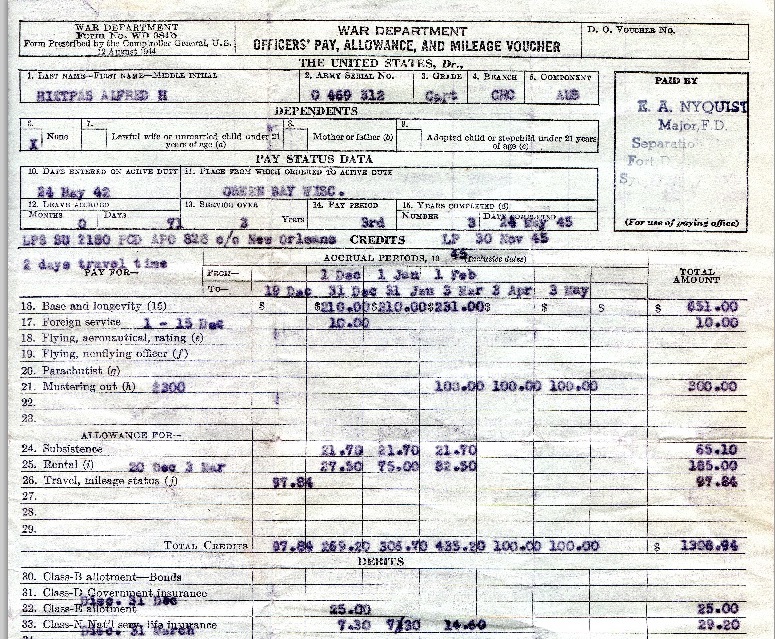 146: Transfer of Ordnance Property. 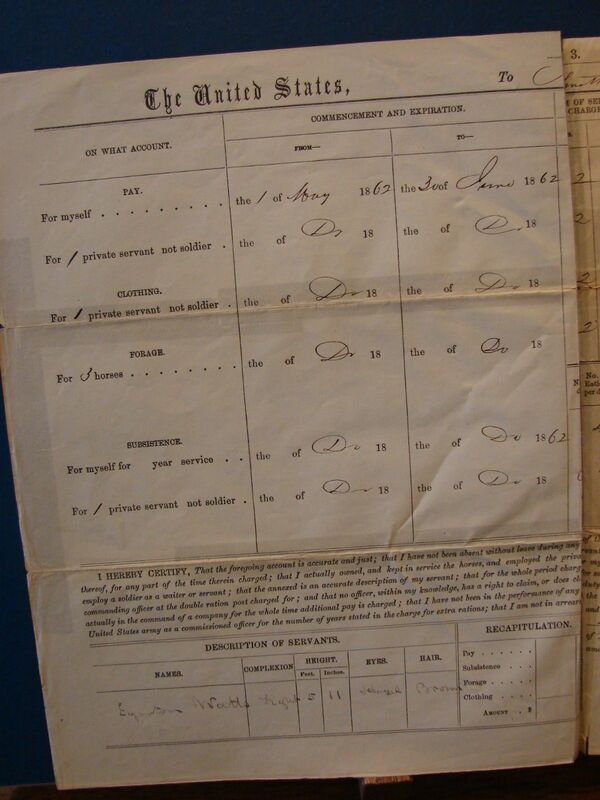 Items issued from C.O. Hdqts. Co 5th Mass Inf. at El Paso, Texas to Chaplain C. H. Rollins on 1 September 1916. There are two categories of items. 1-9-1 apparently are personal items for the chaplain himself: Knife, fork, spoon, meat can and something I can’t make out. 1-9-5 appear to be for the chaplain’s horse: Cavalry bridle, curry comb, horse brush, halter, halter tie rope, nose bag, cavalry saddle, saddle blanket, saddle bags, spurs and spur straps, lariat, lariat strap, link, and watering bridle (author’s collection). 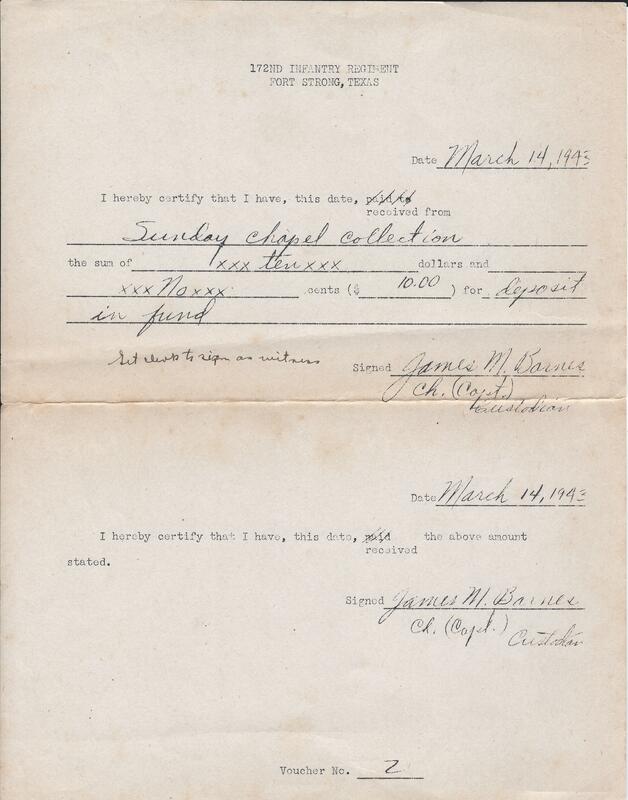 A receipt dated 24 March 1943 and signed by Chaplain (CPT) James M. Barnes for $10 received from the Sunday Chapel Collection for deposit into the fund (author’s collection). 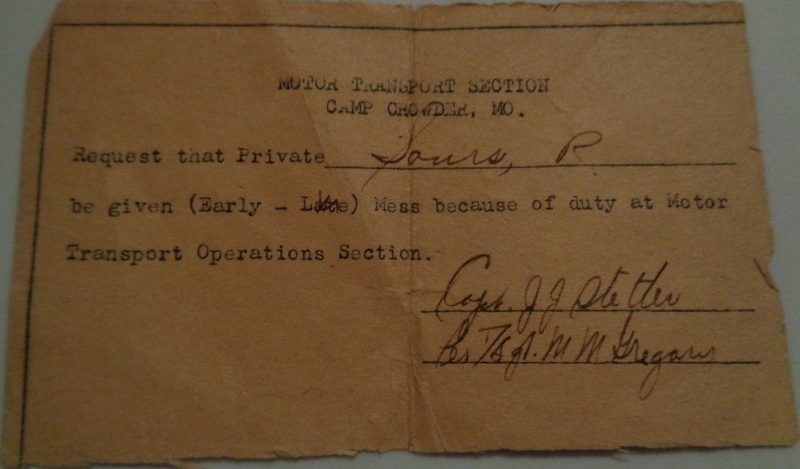 The final LES of Chaplain Alfred Hietpas who was mustered to serve in WW2, dated 19 December 1945. (Author’s collection). Full document in pdf can be downloaded here. 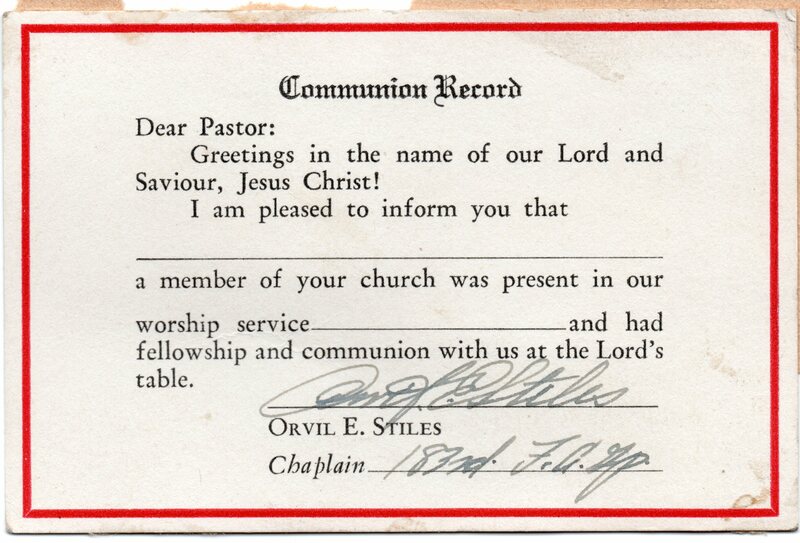 Un-issued Communion Record signed by Chaplain Orvil E. Stiles, 183rd Field Artillery Group, 3rd Army. Chaplain Stiles served 1939-1945 (author’s collection). Certificate of Satisfactory Service for Lieutenant Junior Grade Herbert W. Stroup, Junior, Chaplain Corps, United States Naval Reserve who served during World War II, 6 July 1946 (author’s collection). Request to chaplain for early/late mass due to duty. From WW2 or Korean War era. Certificate of Training given to Chaplain (MAJ) William T. Ingram, Combat Command C, 30th Armored Division for completion of Supplemental Branch Training at the Fort Stewart Chaplains’ School, dated 26 July 1957 (author’s collection).